A professionally laser cut black plastic bezel suitable for 4×20 LCD modules. Whilst building the Thunderbolt Monitor I wanted to provide a clean, professional look to the LCD cutout. It is hard to cut out a very clean hole with crisp corners and straight edges from aluminium without a lot of patience and a lot of filing. I designed a plastic bezel and glass using CAD and had a number professionally laser cut. The plastic is high gloss black. The bezel and glass come with the plastic protective covering still attached to prevent scratches until you’re ready to install it. 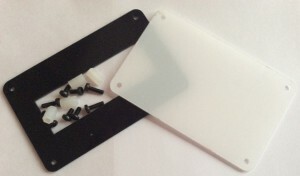 You will also receive the black mounting screws and PVC spacers. The LCD module is not supplied with this product.